Desiderius Erasmus Roterodamus (28 October 1466? – 12 July 1536), known as Erasmus of Rotterdam, was a Dutch Renaissance humanist, Catholicpriest, social critic, teacher and theologian. Desiderius Erasmus Roterodamus (28 October 1466? – 12 July 1536), known as Erasmus of Rotterdam, was a Dutch Renaissance humanist, Catholic priest, social critic, teacher and theologian. 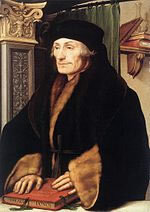 Desiderius Erasmus of Rotterdam was the most famous and influential humanist of the Northern Renaissance, a man of great talent and industriousness who rose from obscure beginnings to become the leading intellectual figure of the early sixteenth century, courted by rulers and prelates who wanted to enhance their own reputations by association with the greatest scholar of the age. Erasmus was a classical scholar who wrote in a pure Latin style. He was an early proponent of religious toleration, and enjoyed the sobriquet "Prince of the Humanists"; he has been called "the crowning glory of the Christian humanists". Using humanist techniques for working on texts, he prepared important new Latin and Greek editions of the New Testament. These raised questions that would be influential in the Protestant Reformation and Catholic Counter-Reformation. He also wrote The Praise of Folly, Handbook of a Christian Knight, On Civility in Children, Copia: Foundations of the Abundant Style, Julius Exclusus, and many other works. Though most vividly remembered now for his critical satires of abuses in the church and secular society and for his work as editor of the first published edition of the Greek New Testament, he was a prolific and influential author in many genres. He was a leading writer on education, author of five influential treatises on humanist educational theory and even a greater number of widely used and often reprinted textbooks taught in humanistic schools throughout Europe, especially north of the Alps; the producer of excellent critical editions of the works of classical Greek and Latin authors, including translations of Greek texts into the Latin that all educated people of his time could read; and the editor and translator of the works of early Latin and Greek Church Fathers, especially important for translations of Greek patristic literature, which had been little known to the Western church during the Middle Ages; the author of books of spiritual counsel addressed mainly to educated laymen of his time, all written in Latin but several of them quickly translated by other hands into most of the European vernacular languages and frequently reprinted; he even wrote and published Latin poems on both secular and religious themes, the one genre in which he had no lasting influence. He was also an active letter-writer, corresponding with contemporaries high and low, famous and obscure, and carefully preserving his letters and publishing some of them since like his Roman models, he regarded the letter as an important literary genre. The one genre in which Erasmus wrote no works at all was philosophy, though he often cited ancient philosophers and dealt (normally in a non-philosophical way) with several intellectual problems of interest to philosophers. Erasmus died suddenly in Basel in 1536 while preparing to return to Brabant, and was buried in the Basel Minster, the former cathedral of the city. Erasmus was his baptismal name, given after St. Erasmus of Formiae. Desiderius was a self-adopted additional name, which he used from 1496. The Roterodamus in his scholarly name is the Latinized adjectival form for the city of Rotterdam. The Erasmus programme was launched in June 1987 and in 2007 celebrated its 20th anniversary. It is one of the best-known Community actions and addresses the teaching and learning needs of all those in formal higher education and vocational education and training at tertiary level. It supports the achievement of a European Higher Education Area (EHEA) and reinforces the contribution of higher education and advanced vocational education to the process of innovation. Erasmus became part of the EU's Lifelong Learning Programme (LLP) in 2007, covering new areas such as student placements in enterprises (transferred from the Leonardo da Vinci Programme), university staff training and teaching for business staff. Erasmus is the perfect example of a European success story: close to 3 million students have participated since it started in 1987, as well as over 300 000 higher education teachers and other staff since 1997 (this type of exchange was also expanded further in 2007). The annual budget is in excess of 450 million euro; more than 4 000 higher education institutions in 33 countries participate, and more are willing to join. 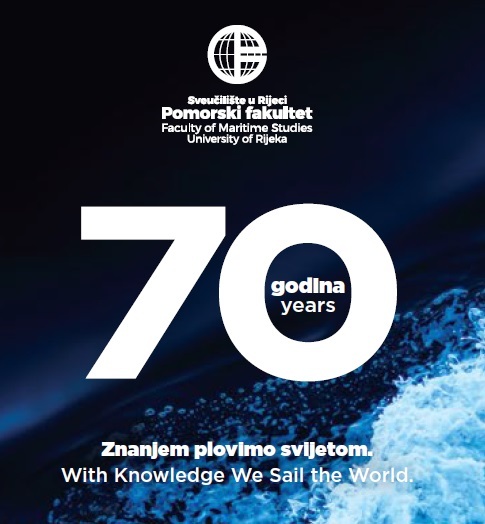 The University of Rijeka joined this program in 2009 and since then has signed over 120 Erasmus bilateral agreementswith universities from the majority of EU countries. This cooperation includes students and staff exchange. In three academic years more than 150 University of Rijeka students and 30 staff members participated in Erasmus.